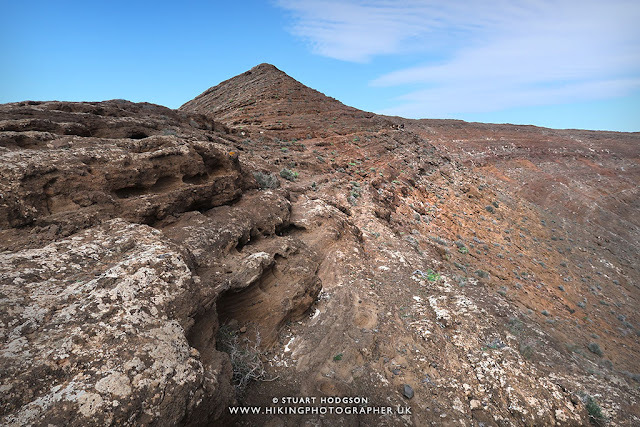 Even though my holiday in Lanzarote was more of a relaxing trip - I always like to try and do a hike on holiday and see some unique landscapes, and a walk amongst the rugged and raw volcanic landscapes of Lanzarote was an opportunity not to miss. Whilst it's not the highest volcano in Lanzarote, Caldera Blanca has the widest crater at 1.4km and it's certainly very impressive. 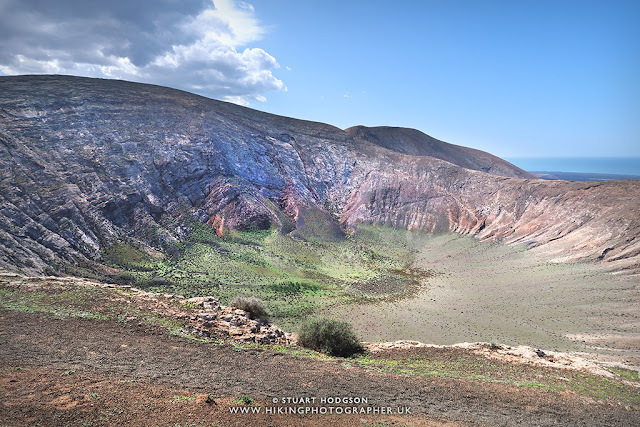 I read before my holiday that if only one walk can be done in Lanzarote then the extinct volcano of Caldera Blanca should be top of that list and after doing the walk I definitely recommend it. 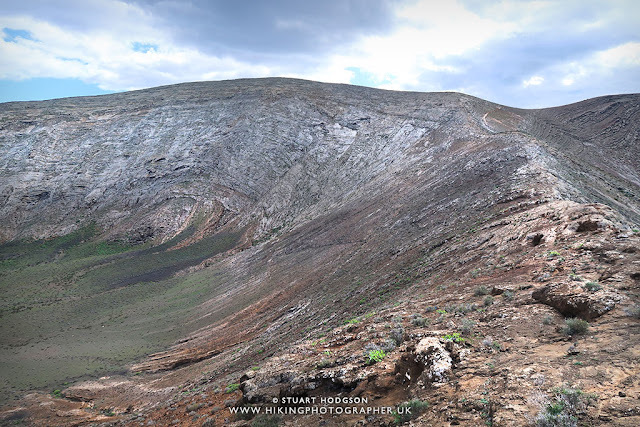 Whilst I always try and do some planning before a walk, especially in foreign lands that I'm unfamiliar with, I couldn't find a great deal of detailed information on the Caldera Blanca walk in terms of what to expect - so I thought I would document my hike on this blog with lots of photos which hopefully helps others do the walk and see some of the best views of Lanzarote! 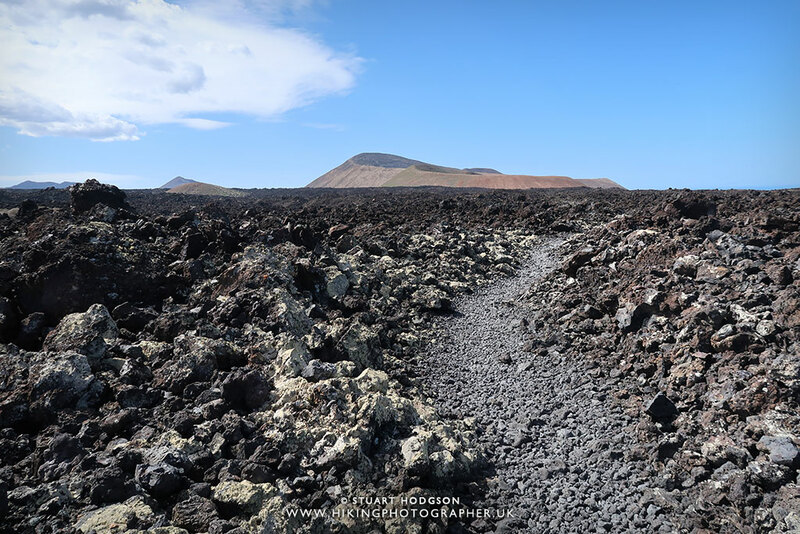 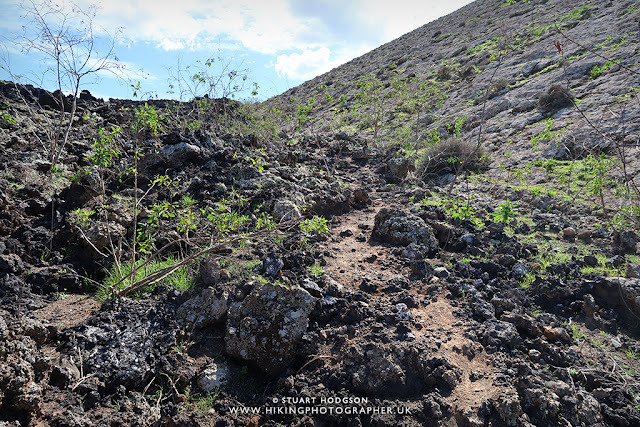 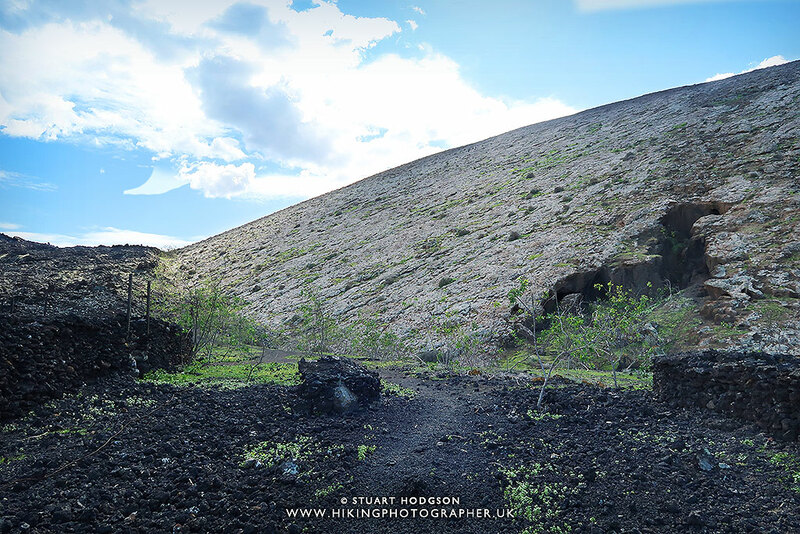 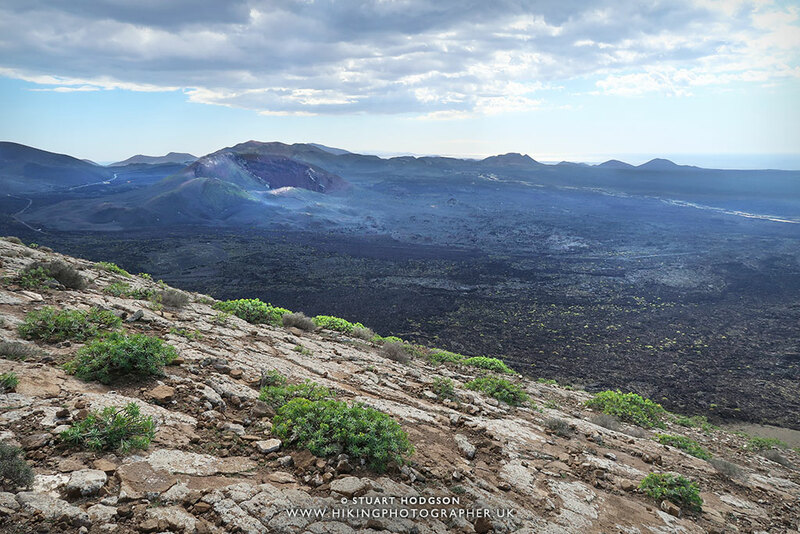 In this photo you can just about make out the paths through the Lava field which makes finding your way quite easy. 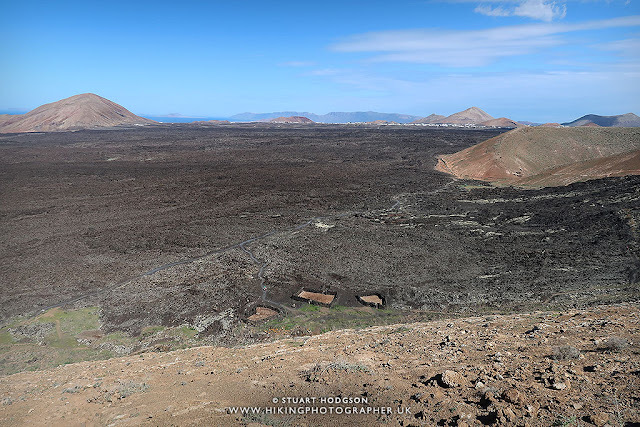 It's a very unique landscape as the lava field you can see here was produced in the relatively recent eruptions from Timanfaya in 1730-36, whilst caldera Blanca itself was formed between 3000-5000 years ago. I'd say there are 3 walking routes you can do here depending on the experience of those in the group. All start from the same place (off road car park near Mancha Blanca), and all head through the Lava Field to the smaller Montana Caldereta and then onto the diagonal path up towards the rim of Caldera Blanca as sown in the map below. If your walking experience or time is limited then once you get on the rim, you could admire the views, maybe even go to the summit - but then come straight back down the way you came up. 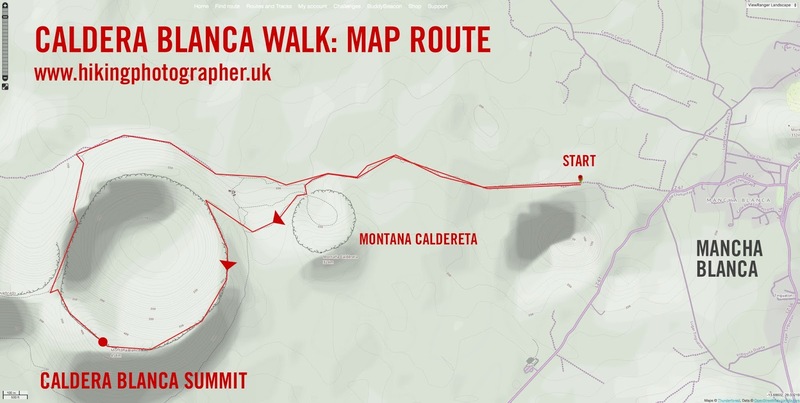 Or you could do a more circular route as shown in the map below - but the path on the decent after the summit is little less clearly marked. 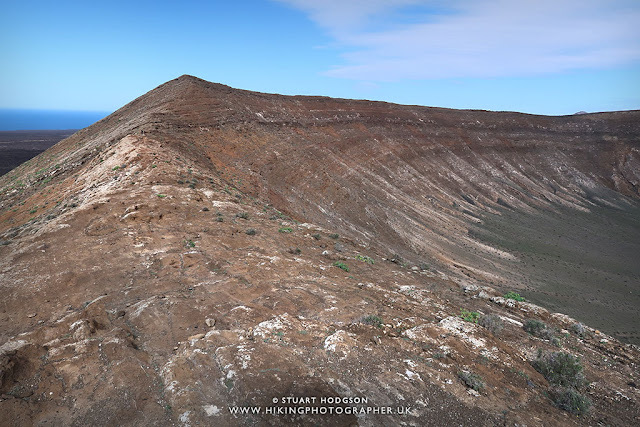 Alternatively you could tackle the full rim of the volcano if you have a head for heights and good footwear and agian come back down from the rim of caldera Blanca the way you went up. This is the most popular circular route to walk to Caldera Blanca (click to enlarge) Most people, like myself, will get here by car. If that's the case you will head for the small village of Mancha Blanca, and then take the dirt track shown on the map to park the car. Then you should do the route clock-wise, approaching the smaller extinct volcano (Montana Caldereta) first, before the walk up to Caldera Blanca and back. 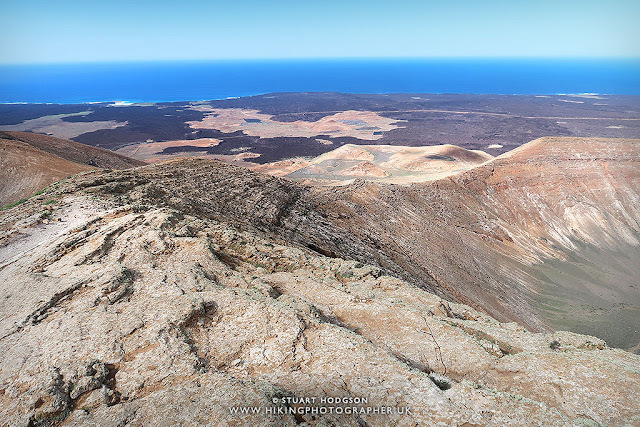 It will take approx 3 hours with time for a few stops. 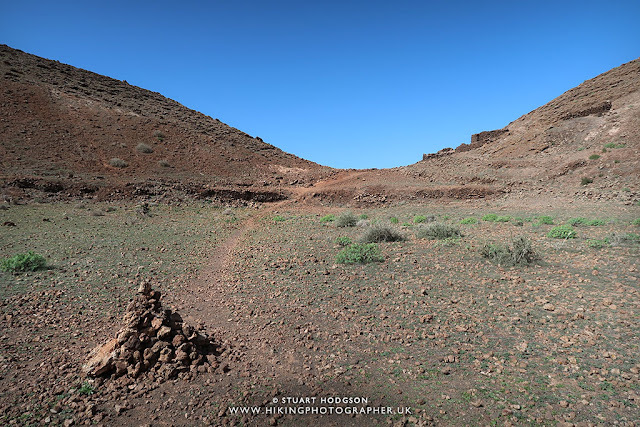 My top on this route is to keep an eye out for the path which decends from the rim on the north-western edge as it's not very clearly marked as the other paths. 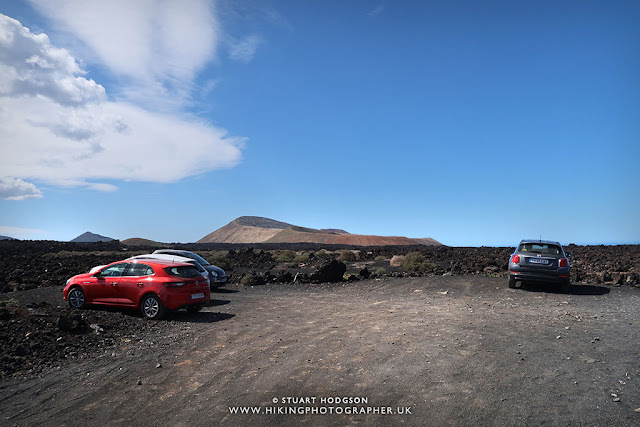 I actually had reservations about whether I could park the car near to the start of the Caldera Blanca walk - but there is actually loads of space for cars along the dirt rack - and it seems quite safe to leave the car here as there will usually be quite a view other people doing the same thing. At the very start of the walk you can see Caldera Blanca in the distance. 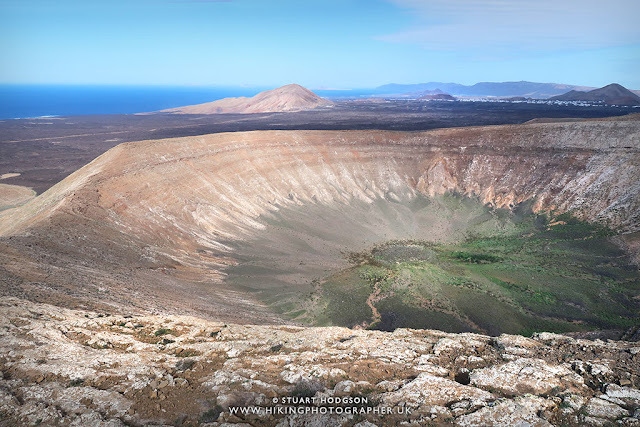 The height of Caldera Blanca is 458m - but the starting point is about 200m above sea-level so its not too strenuous a hike. 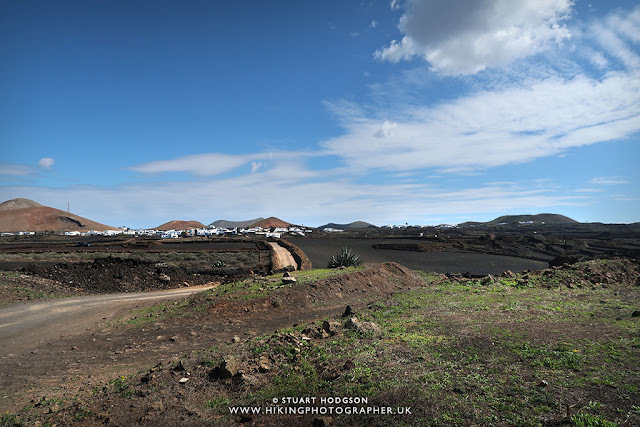 In this heat that a good thing :-) Remember to take suncream, plenty of water and a hat though! The path gets a little rocks in parts - but a long as you have good footwear you will be fine. 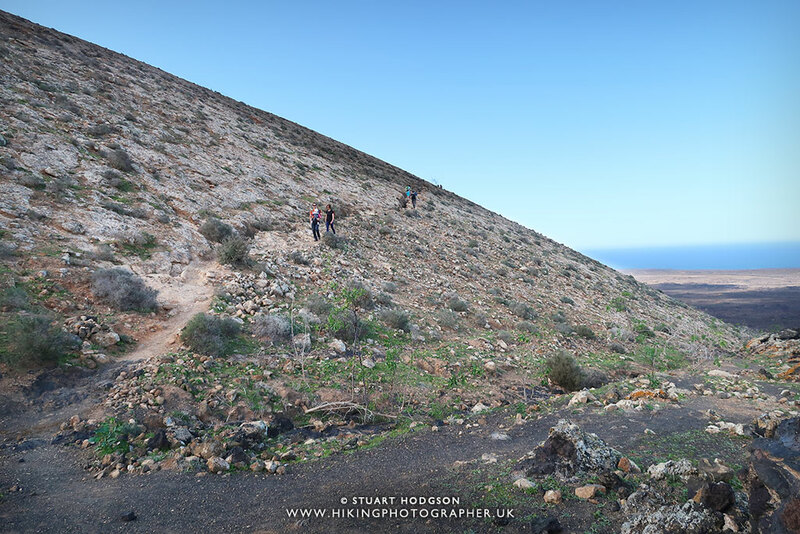 To be honest I wore trainers and didn't have a problem. 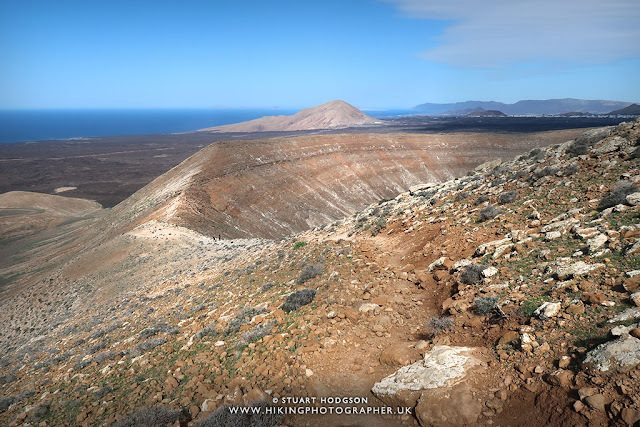 We are gaining height now, and in this pic you can make out the various paths leading to Caldera Blanca. 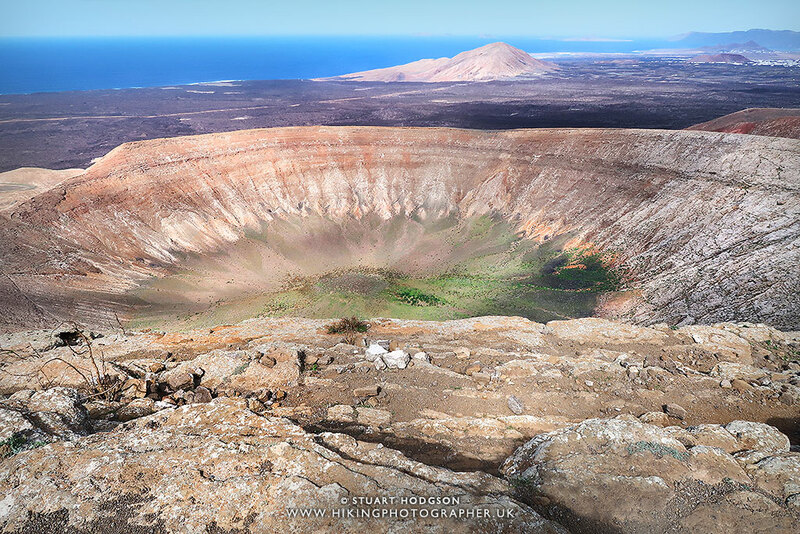 When you reach the rim of Caldera Blanca the views are stunning and quite unexpected. 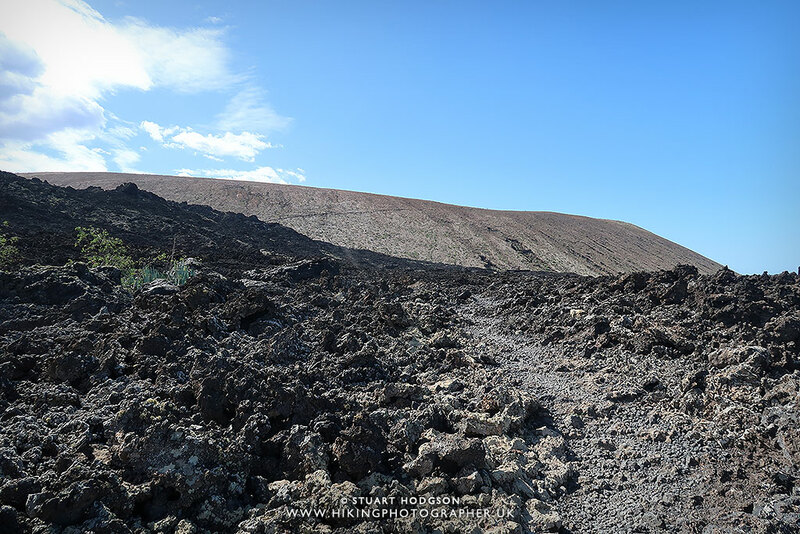 To the left you can see the summit of Caldera Blanca. 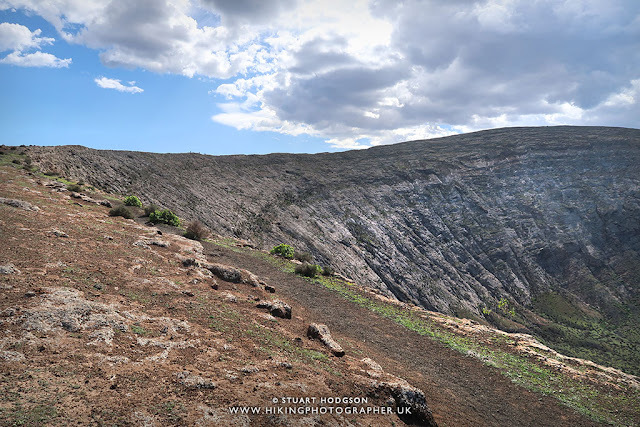 It's worth making this your first little stop off to sit down and admire the views and stick up on water and snacks :-) Some walkers stay here for a bit and head back down the way you came, but on this route it's straight to the top. 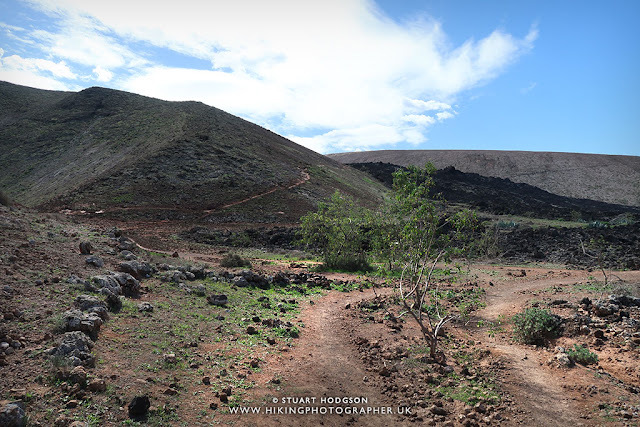 At this point in the walk - it's important pay attention to the paths - as this is where you pick up the path to start the descent down from the rim (if you are following the map route at the top of this page). 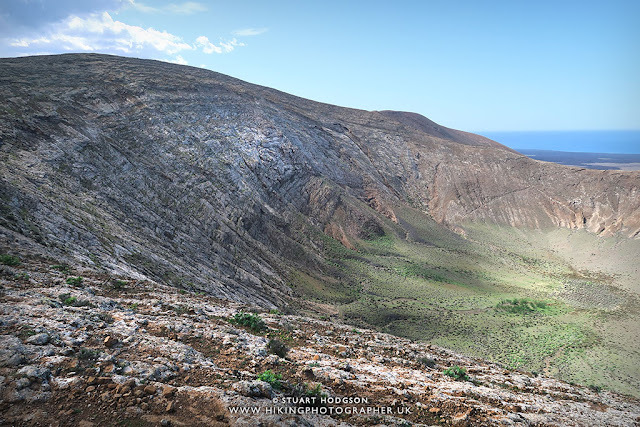 You can just about make out the zig zag path to the centre left of this photo. 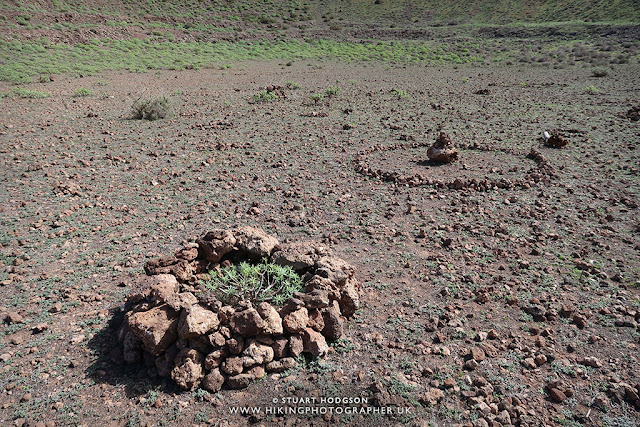 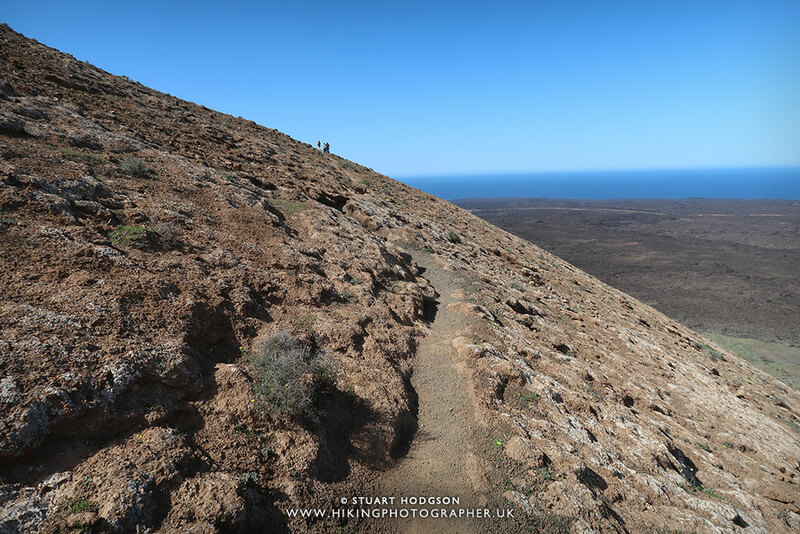 Whilst there is no official pathway - the weathered 'stepped' nature of the rock means you can pick bait of a path out with not much trouble and then just scramble up to the point where you first approached the rim. 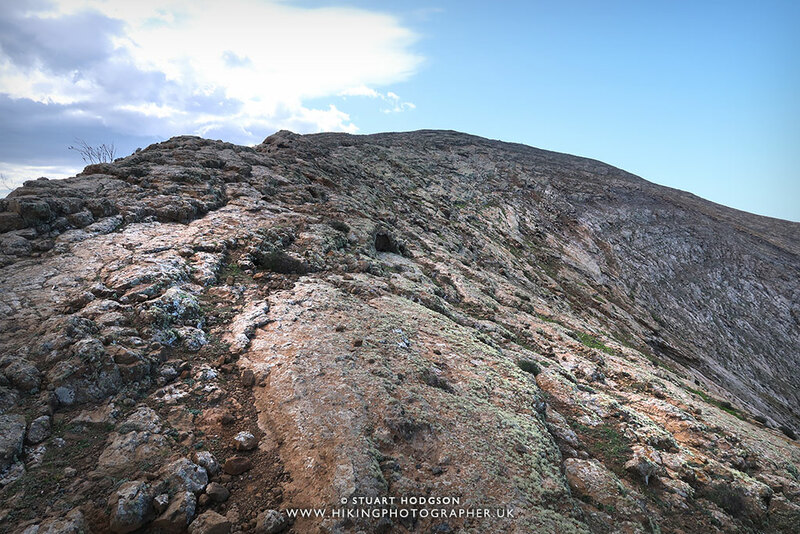 Check the weather forecast just before your hike and plan your route accordingly. 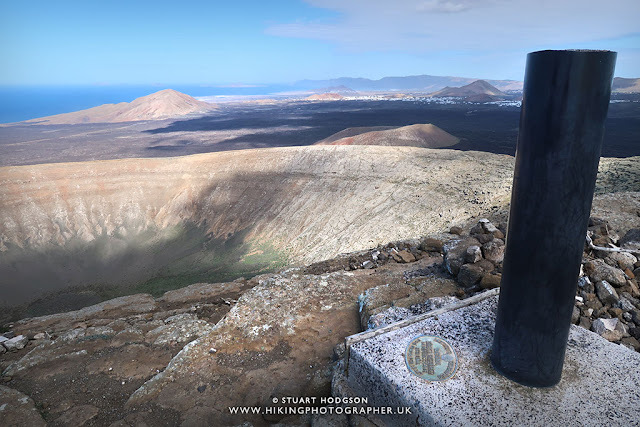 If its very windy (which can often be the case in the west coast of Lanzarote) the more exposed parts of the summit may be quite tricky and even dangerous in very high winds, so you may not want to do a full circlular walk or even get to the actual summit. 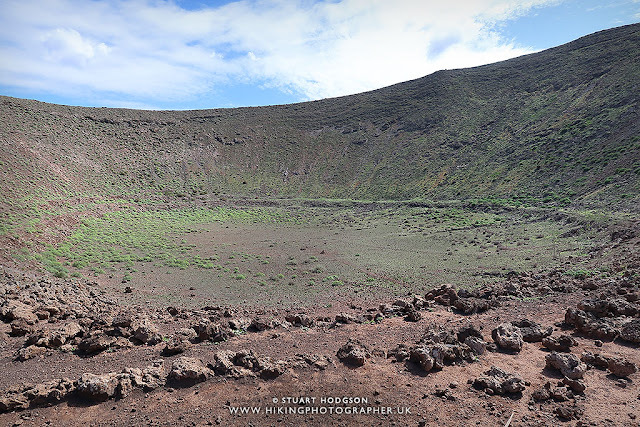 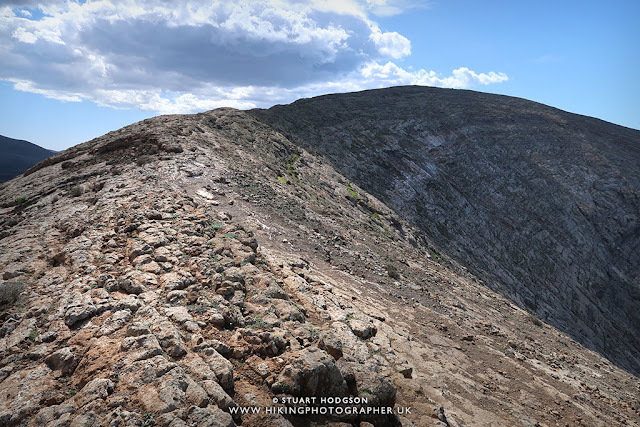 However, the views as soon as you reach the initial rim from the uphill walk are impressive enough without going to the summit point so don't let winds deter you from seeing some of the impressive crater. 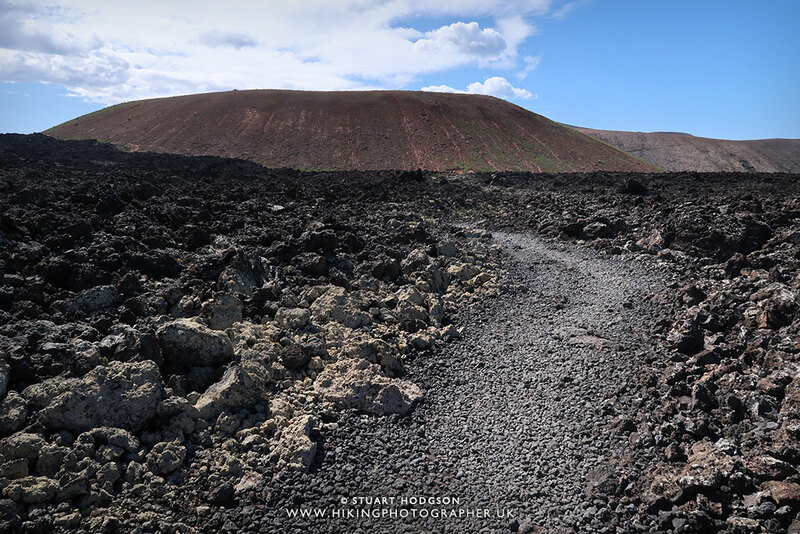 Wear sturdy, closed walking shoes, no flip-flops, as in some places the solidified lava is quite jagged with sharp bits (you will mostly walk on gravel though). 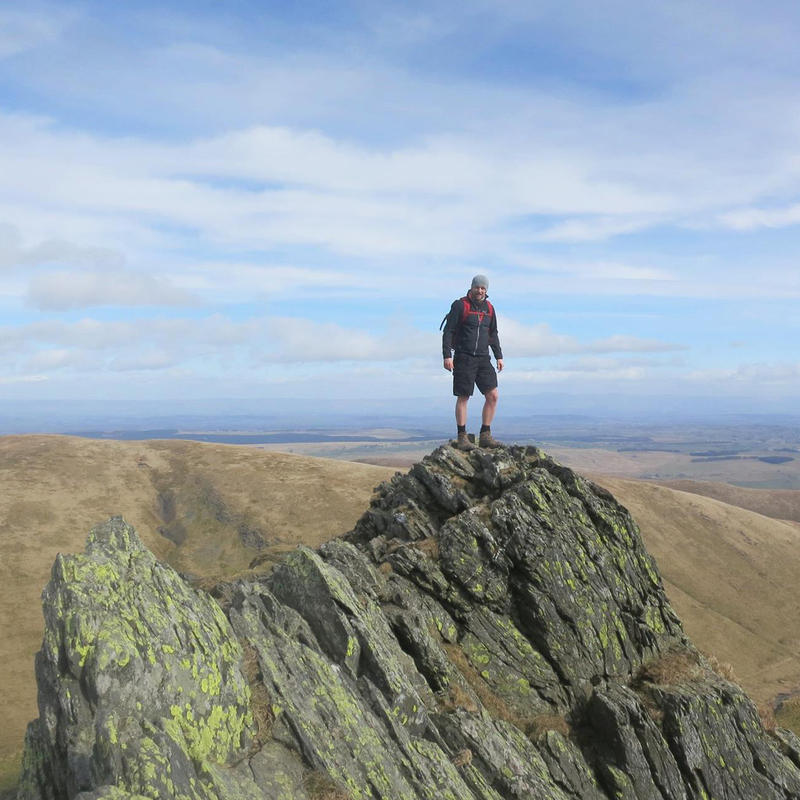 I managed ok in sturdy trainers though. Make sure you have a good idea of the route and print off a map if you don’t have any GPS routes. 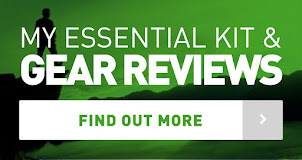 Hopefully this blog post helps - but have a google around and check out other resources & maps. 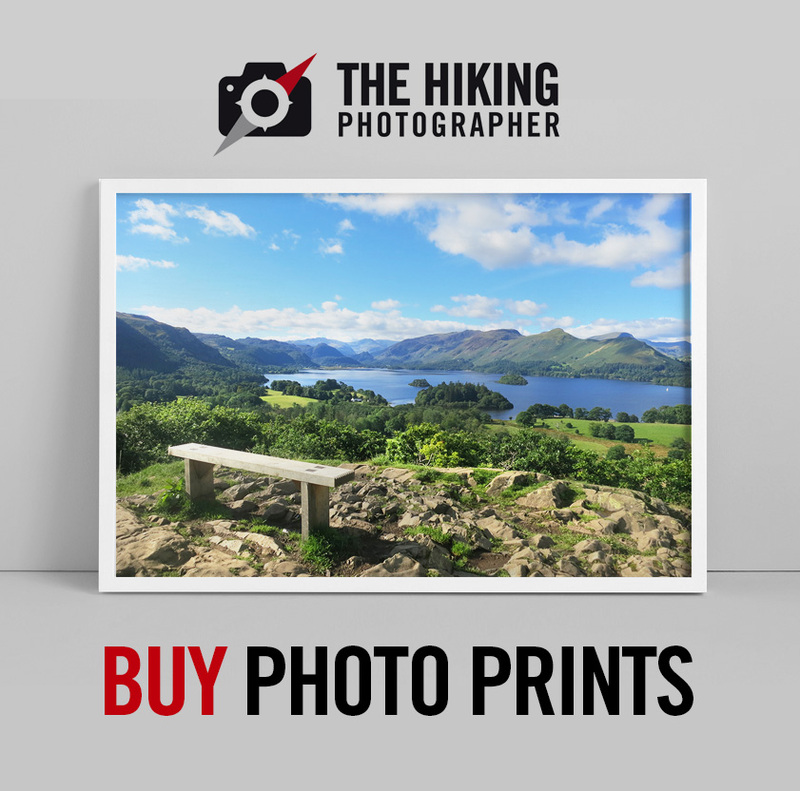 Don’t forget your camera - this is one spectacular place with some amazing views. Well I hope that was a useful blog post and helps you plan a walk to Caldera Blanca if ever you are in Lanzarote. 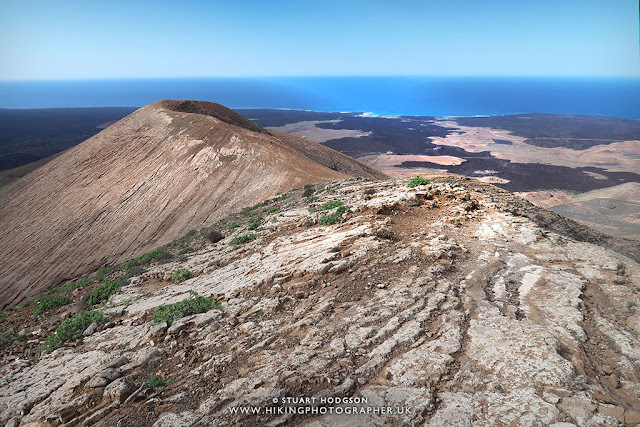 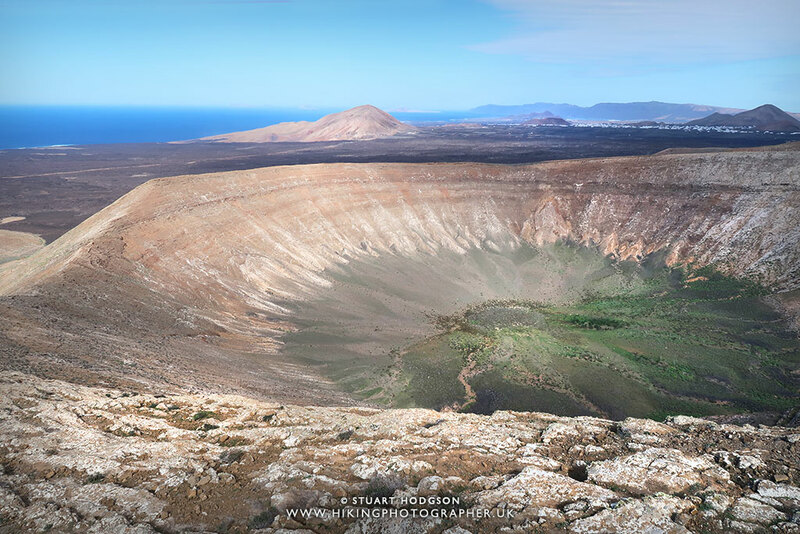 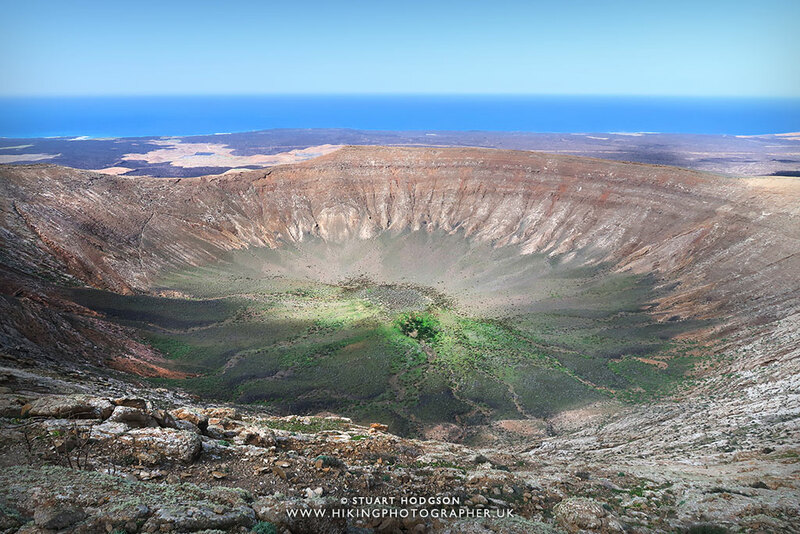 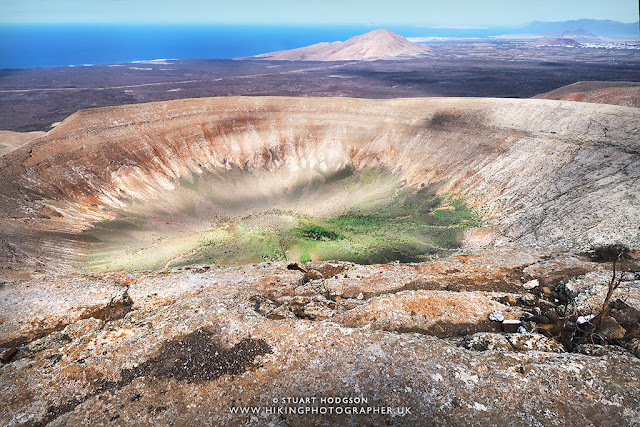 There are not many places in the world where you can hike to the summit of an extinct volcano - so if you are on holiday in Lanzarote and have an adventurous side - then this is a must-do activity in Lanzarote. 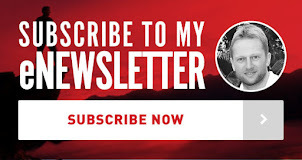 Hi Stuart. Would this walk be easy enough to do in the dark to catch a sunrise from the summit? 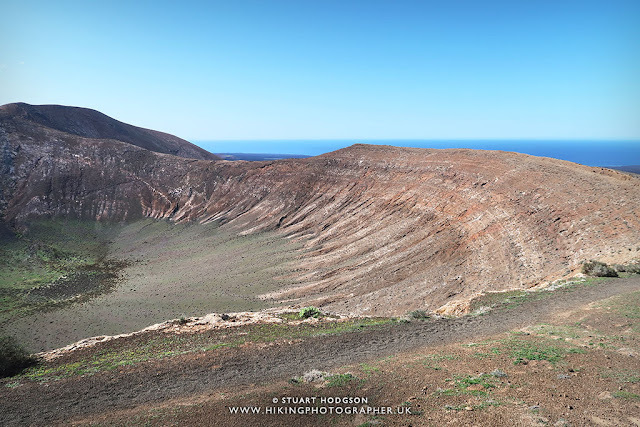 We are heading to Lanzarote next January and I always like to do at least one good sunrise hike wherever we go.